Hi there Over the Big Moon readers. I hope you are enjoying warmer weather and looking forward to summer! It get’s really humid here in Okinawa, but the ocean breeze always feels wonderful. Today I’m here to share more styling and decorating tips with you because let’s face it, I’m obsessed. 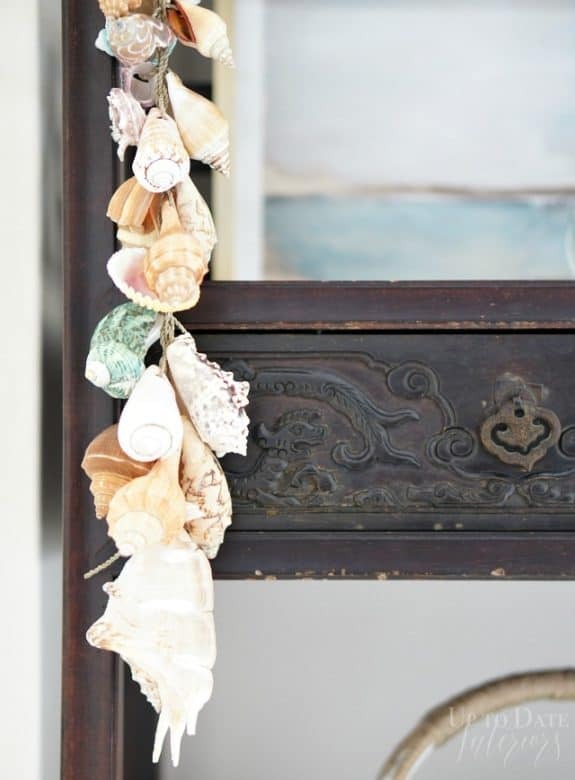 One of my favorite ways to decorate for any season, but especially summer is to incorporate seaside inspired decor. It’s pretty, fun to hunt for, and most of the time, free. 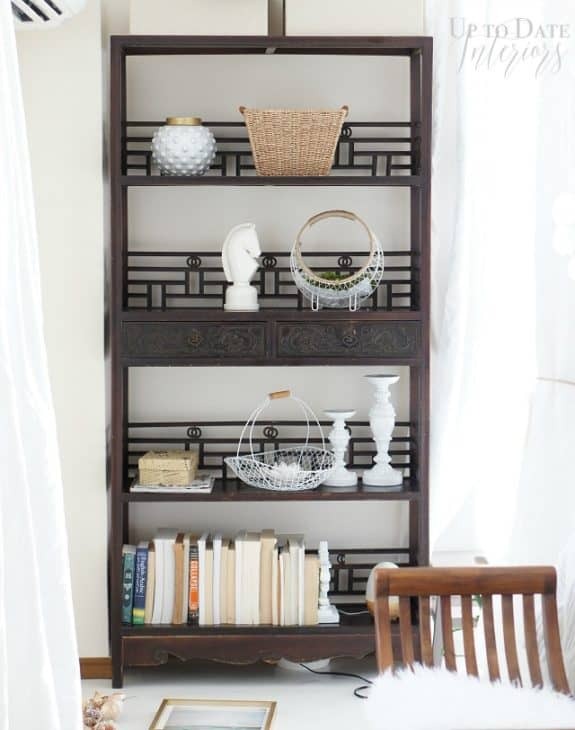 We have a thrifted Chinese eterege in our bedroom that has been neglected since I rearranged our furniture a couple of months ago. It sits right next to our patio doors that overlook the ocean, so beach finds and seaglass totally makes sense for this unique piece. For Spring and Summer months, I tend to use less for an airy, simple, and fresh look. I do like to use a lot of texture and decorating accessories that vary in height. A plant or two always fits in nicely. 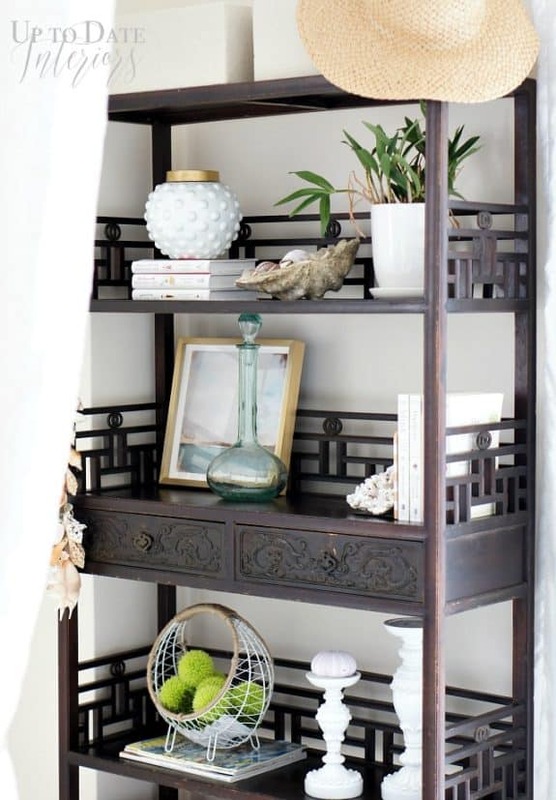 Decorating tip: When decorating shelves, having something that trails or hangs is a pretty way to make to make a connection between the open spaces. My husband bought this shell hanging for a Mother’s Day gift and I’m happy it has a home in our bedroom! 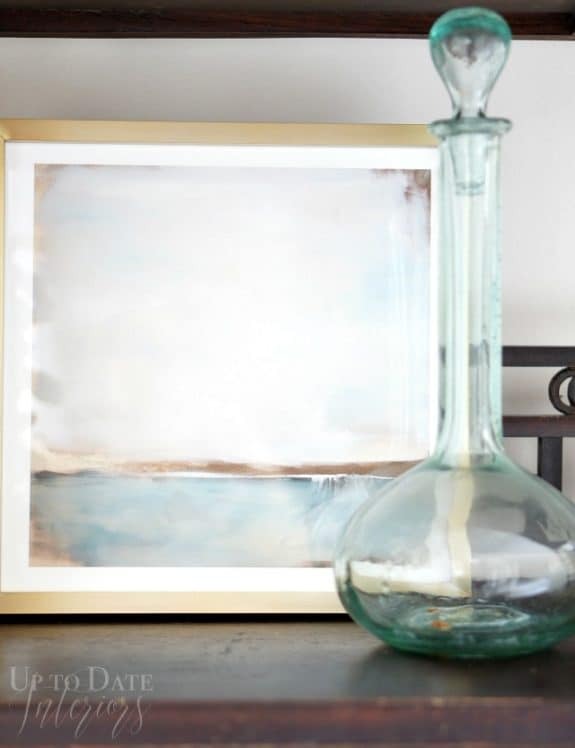 I moved a Minted art print and a sea glass decanter that I found in a California antique mall from downstairs to add to this sweet vignette. 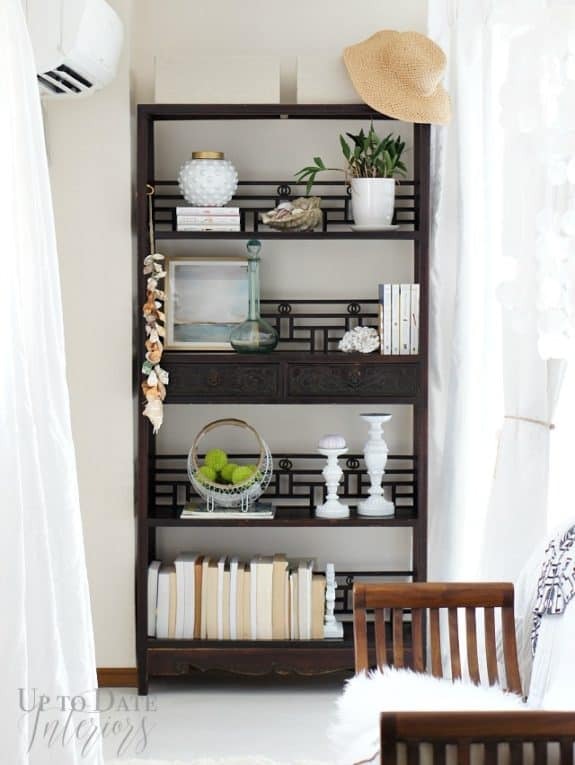 All of the accessories are in light colors to contrast against the dark shelves. 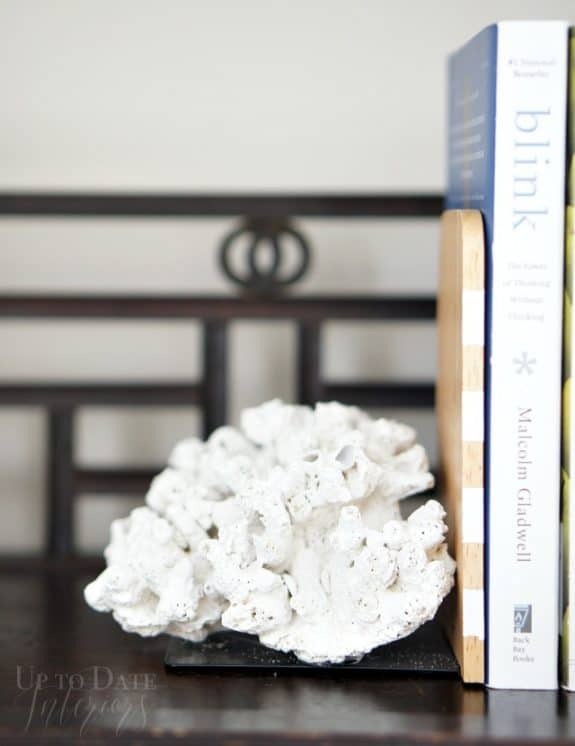 A little DIY coral bookend is perfect for keeping white bound books in place. Decorating tip: A few other accessories are used as “fillers”. I like a nice balance between nautical and everyday decor to keep it from being themey. 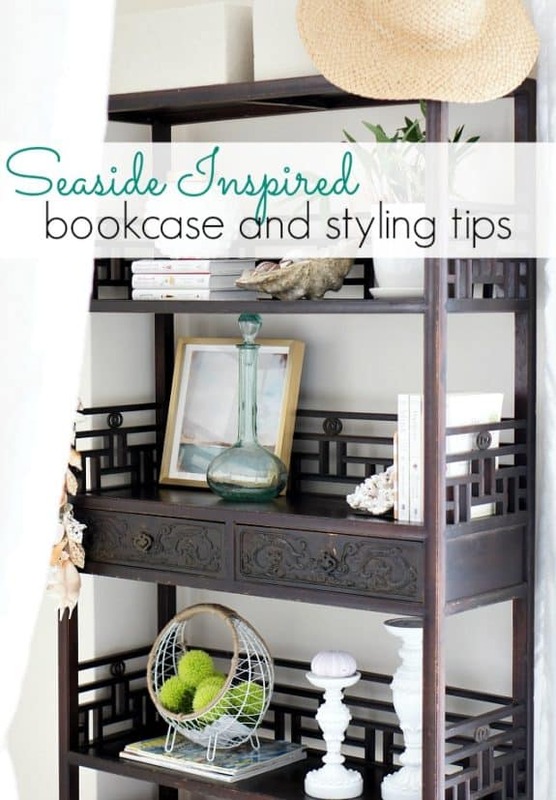 Dividing the shelves into 2-3 sections make styling easy and simple. 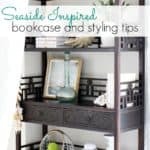 I loved how our seaside inspired bookcase turned out. Thanks for having me today! To find more summer decor, click HERE and HERE. Hello from the coast of Okinawa! 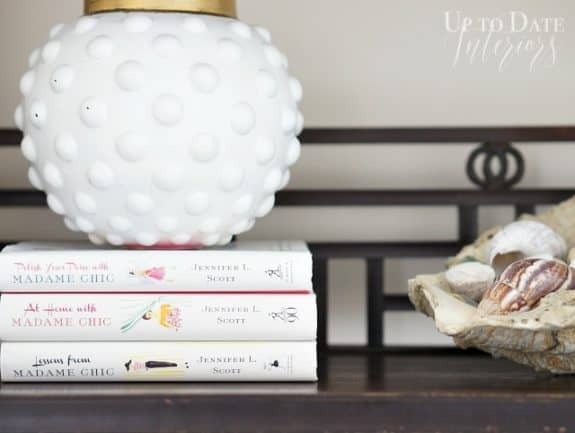 I’m Kathy and I blog at http://www.uptodateinteriors.com! 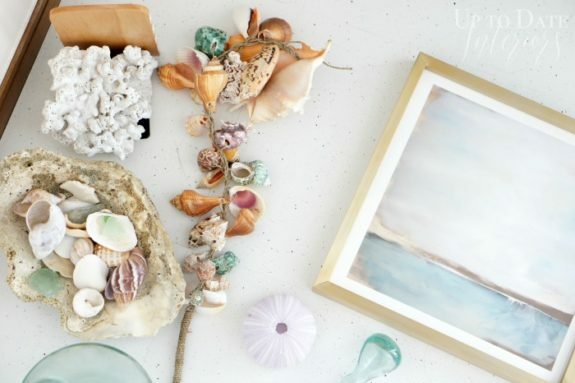 I love sharing rental decorating tips, DIY projects, and handmade decor ideas. When I am not blogging, you can find me spray painting, styling a room for theumpteenth time, hunting for a bargain, or exploring the island with my family. I love the white and blues together…it gives a tranquil vibe!